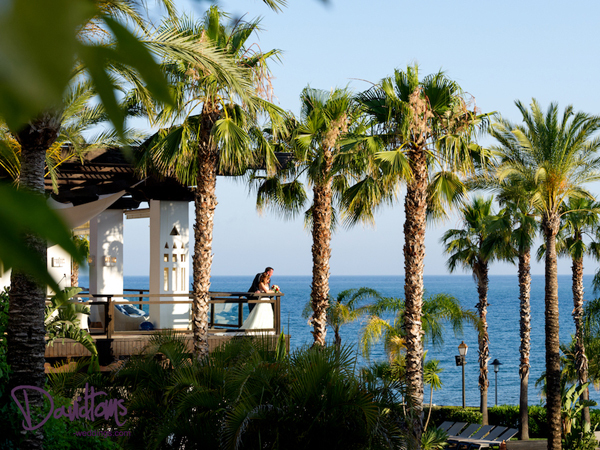 ﻿In Part One we met Jennie and Johan from Sweden who were planning their three-day beach wedding in Estepona Spain. In Part Two we find out all the juicy details of their wedding day. The big day itself took place on the Saturday. The skies were blue and the sun came out. Jennie and her bridal party got ready in the bridal suite of the hotel. One of our favourite hair stylists, Maite, created a soft, up-do on Jennie, gathered at the nape of the neck. For Jennie’s make-up, make-up artist, Nicola paired pale rose gold on the eyes with fresh, glowing skin. The bridesmaids looked beautiful in blue and white floor-length gowns. The floral detailing matched the lace of Jennie’s dress perfectly. Guests were asked to meet our team in the hotel reception and we then walked them through the subtropical gardens to the ceremony area. 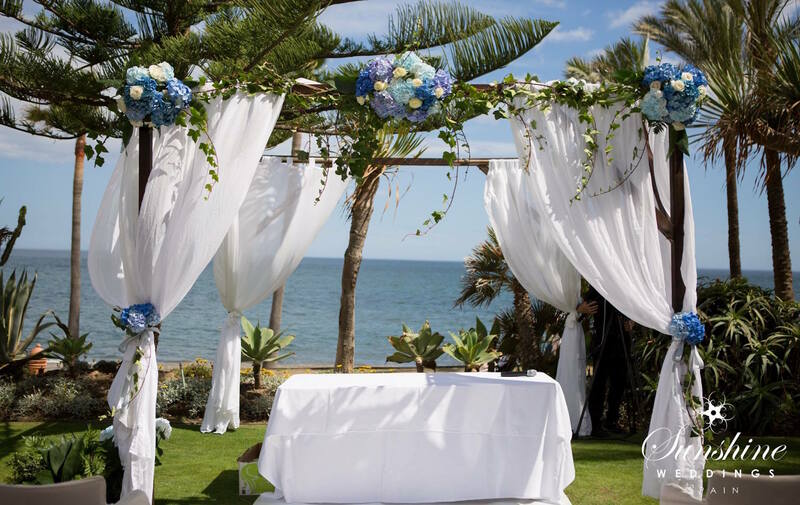 A peaceful, shaded haven with the Mediterranean as its backdrop, it is the perfect place to take your vows. Danish musicians played during the bridal procession and then the couple’s own minister performed the ceremony. 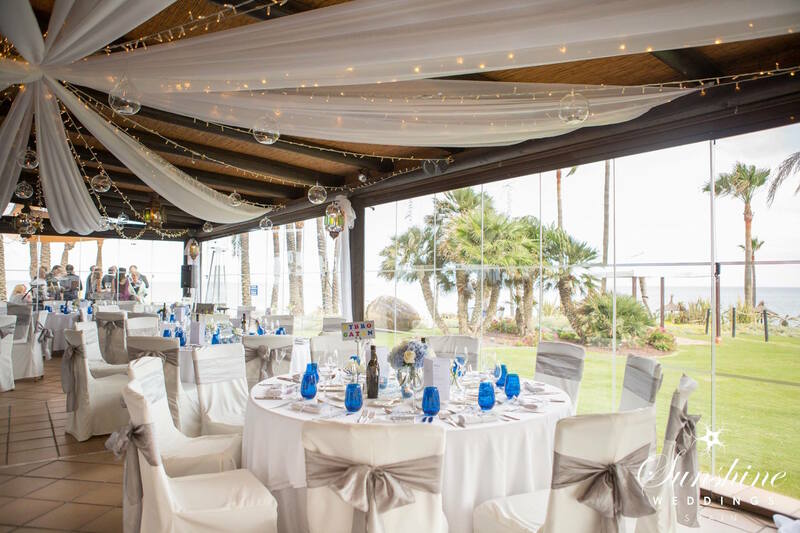 After the vows were taken, guests were led along the beach promenade to the reception area. Canapés and champagne made the rounds, while saxophonist Roberto and violinist Quike played a beautiful jazz set. 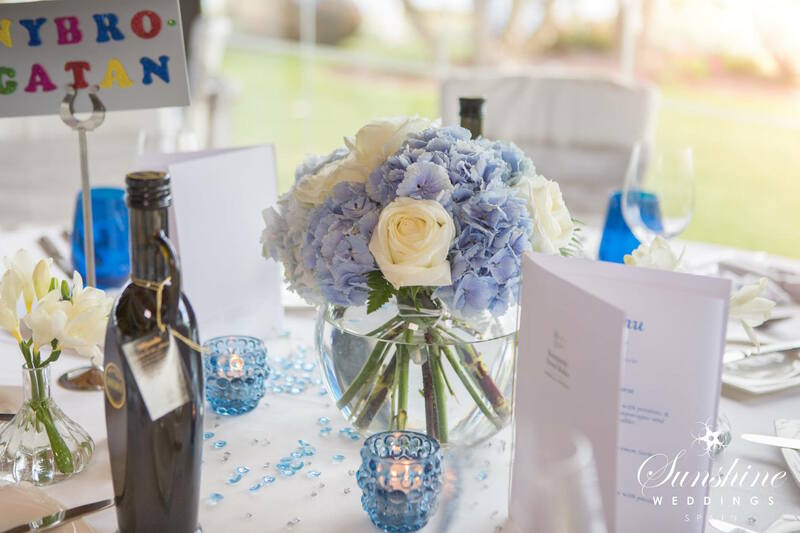 After their photo session, Jennie and Johan made a grand entrance to their wedding reception, setting the tone by arriving to their special song. Then, in typical Scandinavian style, there were many speeches, all announced by the toastmasters who did a fantastic job of keeping everything flowing. For the meal, guests tucked into Beef Carpaccio and Salad, which was followed by Angus Beef. Palates were cleansed with a Sorbet and then the finale was a mouthwatering White Chocolate dessert. Simply sensational. Now it was time to hit the dance floor. The DJ arrived, which allowed Quike and Roberto to do what they do best and the party really kicked off. We set up a photo booth which allowed the guests to get up to all sorts of mischief and really let their hair down.